macroalgae, and also to the health of fishes. The predominant form of iodine in seawater is iodide. The natural seawater concentration of all iodine species combined is approximately 0.06 ppm, classifying it as a minor element. Even in this small concentration, iodine is required for survival of fishes, crustaceans, macroalgae and kelp, and hermatypic invertebrates alike. The importance of iodine in a reef aquarium cannot be overstated. Iodine binds rapidly with latent organic material and is passively removed by aggressive protein skimming and the use of organic-adsorption products such as activated carbon and specialty resins. The combined biological and chemical depletion of iodine necessitate that its concentration be monitored and the aquarium supplemented as needed. The rate at which iodine is extracted from the water is determined by the stocking density of reef-building livestock, type of lighting, and other biological, physical, and chemical conditions. Once the rate of iodine uptake in the aquarium has been determined, the proper dosing rate of this product can be easily calculated. 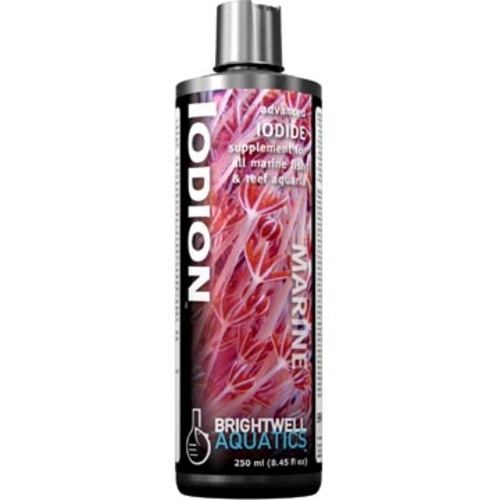 For additional information on iodine and other important aspects of marine chemistry for marine aquaria, please visit our website at www.brightwellaquatics.com. Advanced: Determine the total iodine concentration in the aquarium using an accurate test kit before supplementing. 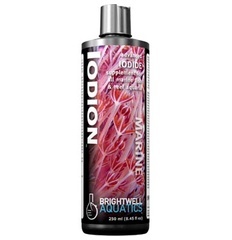 Each ml of IODION will increase the concentration of iodine ("[I]") in 1 US-gallon (3.785 L) of water by 0.625 ppm. If the initial [I] in the aquarium is below 0.06 ppm, add this product at the maximum rate of 5 ml per 25 US-gallons daily until the desired concentration is attained, then dose daily or weekly as needed (see below). Always try to maintain the [I] within a range of +/-0.02 ppm. To determine the dosing rate of this product once the desired [I] has been acquired, measure the daily rate of iodine uptake (i.e. the decrease in iodine) in your aquarium by measuring the aquarium's [I] at the same time each day over a one- to two-week period. To determine the daily dosing rate (preferable to weekly dosing) for iodine maintenance: estimate the volume of water in the entire aquarium system; divide the daily decrease in [I] by 0.625; multiply this number by the volume of water in the system (in US-gallons) to get the daily dosage required (ml) to maintain a stable [I]. Daily dosing maintains a more stable [I] (and more natural environment) than dosing weekly, in which the [I] spikes just after dosing and then gradually decreases throughout the course of the week. Never overdose an iodine product, as severe overdosing can harm livestock and the beneficial microbes that constitute the biological filter. Purified water, Potassium iodide, Stabilized iodide.